This week’s guest on the 21st Century Creative Podcast is Fabrice Bourrelly, artist, architect and Virtual Reality designer. As Fabrice talks about his development as a creator, the conversation ranges from the cave paintings of southern France, to raves in 90s Paris, collaboration with Thomas Heatherwick, Google and Epic Games, and how virtual reality will shape the future of fields as diverse as architecture, medicine and shopping. It’s a mind-boggling journey that will be of interest to anyone curious about the role of the artist in the 21st century. 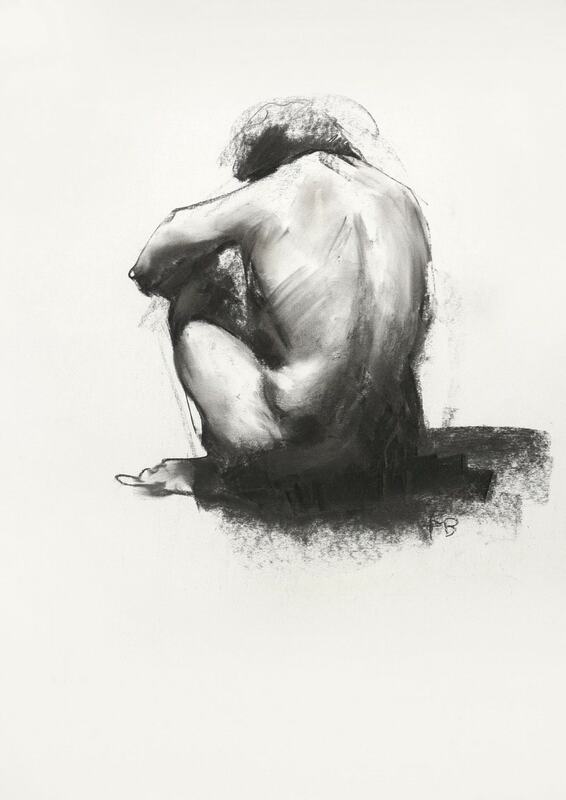 You can view some of Fabrice’s life drawings in the gallery of his website. The video below gives a glimpse of some of his dazzling architectural visualisations. For more videos, and tutorials on how to create 3D worlds yourslf, check out Fabrice’s YouTube channel. Here’s how you can take part – and maybe win yourself a very special prize: one of three limited edition print of one of Fabrice’s drawings, which Fabrice has kindly donated for the Challenge. 1. Listen to the interview part of the show, either in the player above or on iTunes or your favourite podcast platform. So you could invite your visitors into a woodland glade. Or it could be somewhere in outer space. It could be underwater. It could be something from ancient history. It could be something the like of which the world has never seen before. And remember, there is one other constraint: the website also needs to fulfill its current function. So, if you’re a bookshop, or if you’re an author, you’re selling books, you include a way to get books. If you’re providing a service, make this an extension of your service. If you’re a musician, give them a way to experience and buy your music. In other words, your site still needs to serve your visitors, but in a very creative, very unusual environment that people can experience via virtual reality. 3. Once you’ve completed the challenge, leave a comment below this post describing your imagined virtual world, and how it serves your visitors, as vividly as possible. You have until midnight United States Pacific time on Friday 16th June 2017 to complete the challenge and leave your comment. 4. Once the challenge has finished, I will pick 3 winners at random from the comments, who will receive the prize Fabrices has kindly donated of a limited edition print of one if his drawings. I want to stress I’ll pick the winners at random, I won’t be judging the comments as the challenge is not a competition. If you’re enjoying the show it would be a huge help to me if you would take a moment to subscribe to The 21st Century Creative in iTunes. And if you’d like to leave a brief review in iTunes, that would be even more helpful. The more people who subscribe and review the show, the more visible the show will be in the iTunes store, and the more creators I can help with it. This is particularly important in the first few weeks of a podcast – so if you enjoy the show, and you’d like to support it, taking a few moments to subscribe and/or review will give the podcast the best chance of success. Ha! Drawing on the Right Side of the Brain is right here on my desk, one of my projects for this year. I, too, have it on my desk, but it’s been there for 15 years, half-complete (says the optimist). A website visitor is standing at a door with the word “Stage – restricted access” written on it. As they approach for a closer look, the door is opened from the other side by me as I greet the visitor with a huge smile and salute. The visitor can see a flurry of activity in the background, stage hands and technicians all coming and going as well as my band getting their belt packs adjusted, doing stretches and doing final warm ups. I say, “Hey, welcome to my website! You’ve joined us on a very special leg of our tour, I hope you’re ready for this! Come on, I’ll show you around – be careful not to step on anything!” Also in the distance, the sound of a great multitude can be heard – we are backstage at a stadium type concert and the audience is waiting for us to come on. Just then, the stage manager gives me the sign for standby in one minute. I signal the visitor to get ready, we’re about to go on. As soon as we do our band huddle, we make our way to the stage through a series of doors, past a lot of gear and cabling on the floor. We pass a table on the left with a whole lot of our merchandising on it – the visitor is given the option of whether they want to buy CDs, DVDs, T-shirts or apparel as a purchase basket pops up magically out of nowhere. As we adjust our in-ear monitors, the stage manager hands each of us a bottle of water and we exit the wing to the near deafening shout of a 30 000 strong audience all ready to get their party on. The visitor is allowed to follow of us onto the stage and experience the first song, being able to roam anywhere on the stage and into the moshpit (if they so desire). The simulation ends with the visitor doing a stage dive into the mosh pit. There are many shelves of books, comfortable chairs and reading lights. Shapes float through the air, attracted to the visitors who will most connect with them. When the visitor touches the drifting dream images they can interact with the idea and find my works that resonate with them. A spiral staircase reaches upwards in the centre of the space towards shelves of books by other people that are connected by common themes and ideas and downwards towards books, knowledge and art that are my source and inspiration. Each book, picture and idea form takes the visitor to another world. There is a lush epic landscape full of exotic trees and bushes and streams. Hands holding a pencil, on huge long arms reaching down from the sky start to sketch 3-D stick figures of fantasy creatures, and the hands quickly add 3-D form and color and shading and details and then the creatures come to life and run or fly away. The hands continue to draw other fantasy creatures. And the viewer can walk around and explore this world and see other fantasy creatures on a lake or in a meadow. And if the website visitor clicks on any fantasy creature they will be taken to a website page where they can draw (step-by-step) that fantasy creature. There also will be flying books occasionally flying by, and if the viewer can manage to click on the flying book they will be taken to a website page where they can buy one of my books on drawing fantasy creatures. If the viewer clicks on one of the large hands drawing they would be taken to a website page telling about me the artist who drew these creatures. MickeyHadick.com offers my stories and books. The VR version would begin in a lobby with three doors. The doors are marked “Read,” “Listen,” and “Watch.” The visitor may enter any door and, in the respective next room, select any of my books or stories to enjoy by reading, hearing, or watching it. The visitor can leave any time they want, but they always exit through the gift shop where they can purchase any of the stories or books. Since this is a thought experiment, I’m going to just say that I’m sufficiently compensated for my work to be off in a VR world adventure on my own, reading, hearing, and watching stories. So I hope I’m still on time for this challenge, I listened the podcast today. My site shows allot of my VJ & mapping work so my idea is to make a virtual 3D world with buildings where my movies are being ‘mapped’ on to. It’s almost pitch dark so you can only see vague contours, but with the controller the visitor can shine his own light on what they want to see and when a building or 3d object/ interior is being shined upon, the movie that fit’s with the location/space starts playing. You’re in good time Anne, the challenge is open till midnight (US Pacific time) tonight! I don’t have an author website yet, but I am planning to make one once I am done with school (I am pursuing a new certification while working full time). In place of my fiction website, I envision people stepping into a beautiful spacious library- lots of light filtered through multi-storied windows, balconies, and winding staircases. If you wanted to buy one of my books, you would go through a particular door leading to a room that replicates one of the key settings in the story. One of my stories has a cave with neolithic art (I did enjoy the discussion about the cave art in the beginning of the podcast). So you step through the door from the library and find yourself in a dim cave, which looks like it hasn’t been disturbed in a very long time and feels very old. And you can take the torch and examine the strange symbols on the walls, and try to make out what they mean (the symbols are my invention, of course). I am really enjoying the podcast so far. Thanks Mark! Thank you for taking part everyone. This week’s Creative Challenge is now closed. I’ll shortly send my feedback and announce the winners via the 21st Century Creative mailing list.